The blockchain is a structure of data that represents the financial ledger entry, or a record of a transaction. Each transaction is digitally signed to ensure its authenticity and that no one tampers with it, so a ledger itself and the existing transactions within it are assumed to be of high integrity. 5 Step 3: Create a hash based on a previous block. 8 Step 6: Run the project and get the blockchain. You can refer to Genesis Block as the first block of Blockchain because Blockchain is an array of blocks and Genesis is the first block of the Blockchain. The genesis block is the first block of the blockchain. The genesis block is generally hardcoded in the applications that utilize its blockchain. The Genesis Block is also known as Block Zero or Block 0. It is an ancestor that every Blockchain network’s block that can be traced to its origin back. Remember how every block in the Blockchain is linked back to the previous block using the hash in the block header? You keep going back, and you realize every block is hence connected to the genesis block. Our Genesis Block contains the following fields or properties. So, if we combine all these properties into one object, then it will become a Genesis Block. So based on this block, we will mine the second block. Then from the second block, we will extract the third block and so on. That is why we need a Genesis Block to start a Blockchain. The first step is to create a project. Type the following command. Now, generate the package.json file in the case in future, we need to install any node modules. Remember, I am using Node v11.3.0. Next step is to create a new file inside the root called genesis.js and add the following code. Here, we have taken an object with its initial values. As I have defined earlier, our block contains the four properties. This is a genesis data, so we need to hardcode this values. The properties timestamp and data are you can understand. But I have used SHA256 algorithm to convert the simple text into hash text. Actual text for lastHash is a krunal, and actual text for the hash is a krunalHash. Inside your project root, create a file called block.js and add the following code. So, here we have imported the GENESIS_DATA for our block. Then we have defined the Block class and passed the parameters to the constructor when we create an object of the Block. We have also defined the static method called genesis() which is responsible for returning the Genesis Block for our blockchain. Remember, we have previously defined the GENESIS_DATA not block. After creating an object of this class, it will become a Genesis Block. Step 3: Create a hash based on a previous block. We need to define a function that can create a hash based on the previous block’s hash. So, first let us create a new file inside the root called crypto-hash.js and add the following code inside it. Now, to create a Hash, we need the three properties. So, we have first required the crypto module provided by the Node.js. Then we have defined the function called cryptoHash() which will accept the inputs. Here we have used spread operator which is the syntax of ES6. Inside that function, we have called the createHash() method and pass the sha256 as a parameter. That means we need to create a hash based on the sha256 algorithm. Then we have sorted and join that three parameters and return its hex values. So, finally, we can get the current block’s hash based on the previous block’s three properties. So, we got the Genesis Block and the hash of that block. Now, we need to write the function that can generate a new Block based on the previous block. Right now, in our case, it is a Genesis Block. Now, import the crypto-hash module inside the block.js file and create a new function called mineBlock() and pass the two parameters. So, our final block.js file looks like this. So, here we have defined the method called mineBlock and pass the two parameters. The mineBlock() will return a complete new Block based on the previous block. Now, it is the time to create a Blockchain from these blocks. We have completed the step of creating a Genesis Block and mining a new Block. Now it is the time to develop a blockchain. That is why create a new file inside the root called blockchain.js and add the following code inside it. So, first, we have imported the Block.js file and then create a class called Blockchain. The Blockchain class is responsible for adding a new block inside the blockchain. The blockchain is an array of the blocks starts with Genesis block. So in the constructor, we have not defined an empty array. Instead, we have filled the chain array with the Genesis block. Then we have defined one function called addBlock() which accepts the data. Now, before adding a new block to the chain array, we need to mine it. That is why we have called the Block class’s mineBlock() method to extract a new block. For mining a new block, we need a previous block and data. That is why we have used this code this.chain[this.chain.length-1] because it will return the last block in the blockchain and data is already we are passing to that function. So we get the new block based on the previous block and data. Next step is to add that newly mined block inside our blockchain, and that is it. The last step is to run this project and get the blockchain. Step 6: Run the project and get the blockchain. Now, the last step is to create a file inside the root of the project called server.js and add the following code. 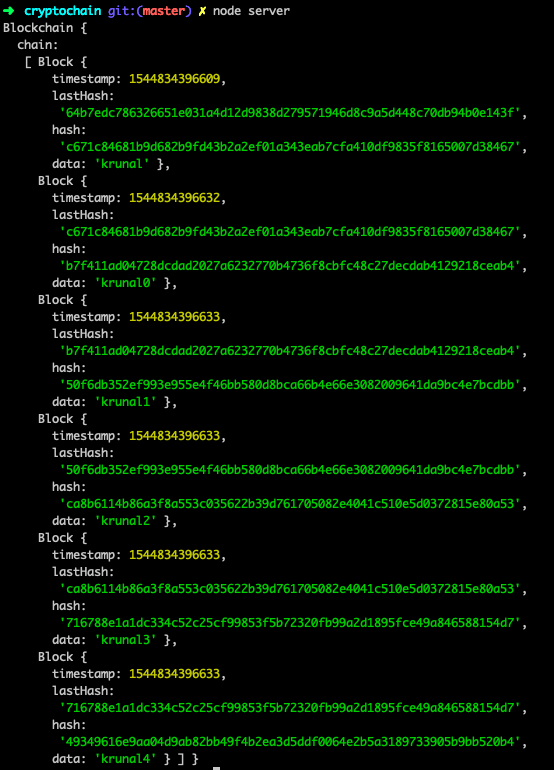 So, here we have imported both the block.js and blockchain.js file and created an object of the Blockchain. Then we will loop through that blockchain and add the data to that blockchain and created the six blocks in the blockchain because one is Genesis and five based on previous blocks. Go to the terminal and start the node server. You will see an output like this. Hi Krunal can you assist me on this error. I just change the data ‘krunal’ using my first name. Thanks in advance. All js are save in one project folder.